CooksRecipes has quality, kitchen-tested recipes for pork, ham and bacon sandwiches that you can count on for successful deliciousness. 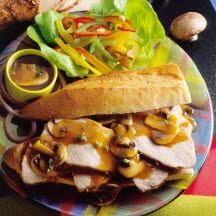 Au jus is the phrase that describes serving meat with its own natural juices. A simple recipe that creates delicious results. These 'grown-up' open-faced sandwiches are sure be a hit with family and friends. 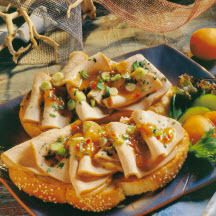 This is also a great recipe for using leftover pork roast or ham instead of stir-frying pork strips. 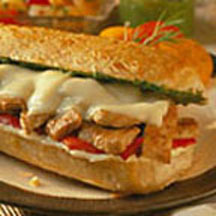 Prepared either way, it's a delicious hot sandwich.